Champagne for arrival drinks? or something a bit different? This time of the year we meet our couples and their family’s who are putting together the final details for their special day next summer They come for a tasting at our kitchens to finalise their menus and it gives us a chance to go through timings and specifics of the day. One of the things we always discuss is alcohol arrangements! Traditionally guests have always been met with a glass of champagne on arrival, but is that what they really want on a hot summers day after being in church and chased around by the photographer? In my experience everyone is gasping for a longer drink and hungry for food, so I would always suggest something more thirst quenching, rather than a small flute of champagne, and of course some of our delicious canapés! This year we have mixed many a cocktail and the feedback is always welcoming, so if you are having that relaxed, outdoors, tipis or marquee wedding, go with something like the following, it just suits the day so well! A long cocktail, filled with fruit and ice, served from big glass decanters makes a unique change from the traditional! 1. 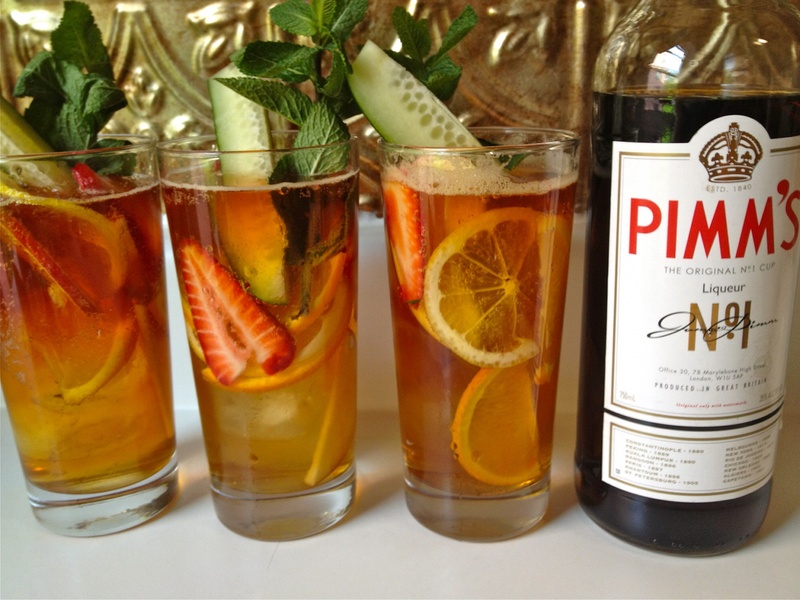 Pimms, of course, a lovely summer refreshing drink, made with lots of ice and strawberries, cucumber & mint and lashings of ice cold lemonade. 2. 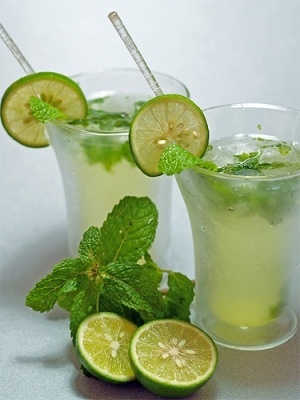 Mojito, another classic, mint sprigs with sugar, lemon and lime juices poured over ice, add rum and club soda to finish, very refreshing! 3. 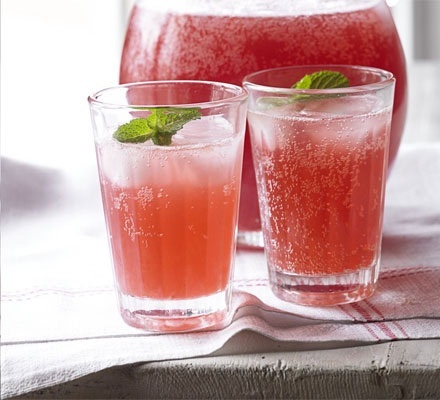 Alcoholic pink lemonade, this not only looks but tastes great! Vodka based mixed with Pink Lemonade and ice, topped with mint and a strawberry! 4. Alcoholic ginger beer. 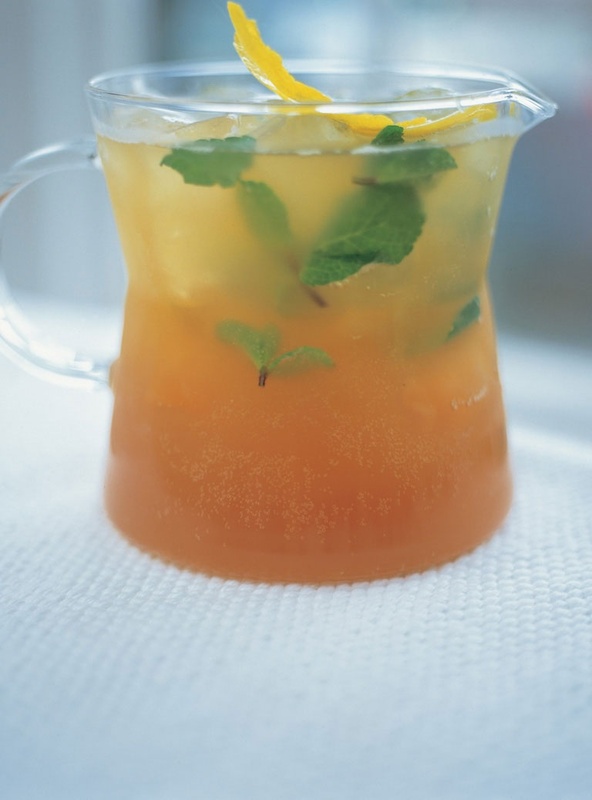 Rather than brewing your own, mix vodka or gin with shop bought ginger beer and top with lime wedges, mint and ice. You can also make this with whiskey. 5 & 6. These have to be the two created by Dan & Katie for their wedding in Henham. Both cocktails were created by the bride & groom to show their individual style. So Dan’s ‘The Big Apple’ was made from Apple & cinnamon infused whiskey, pressed apple juice & ginger beer. 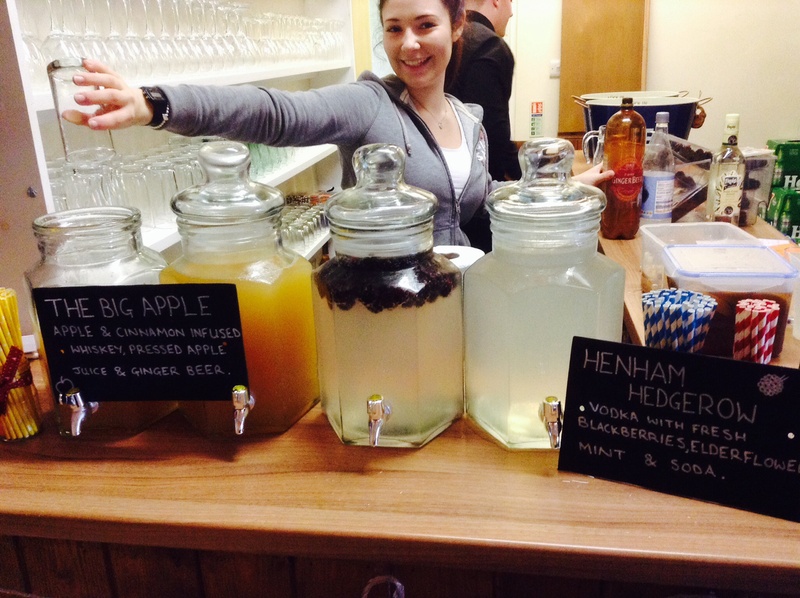 And Katie’ ‘Henham Hedgerow’, vodka with fresh blackberries, elderflower, mint & soda. So new menus photographed, here’s a little taster of things to come! 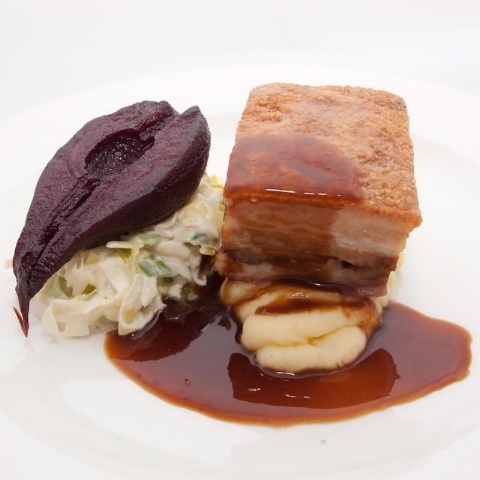 Slow cooked Pork Belly, Red wine pear, Creamed leeks & mash, yum! Sneak preview of new dishes! Successful day in the kitchens yesterday, Dan & John cooked their hearts out and produced some delicious looking food for our 2014 menus! Thanks to Daniel who brought his tripod, camera and lots of very professional bits to take the photographs for us. These will be updated on the website over the next few weeks. So for those who have never visited us, this is where it all happens! And just to tickle those taste buds! 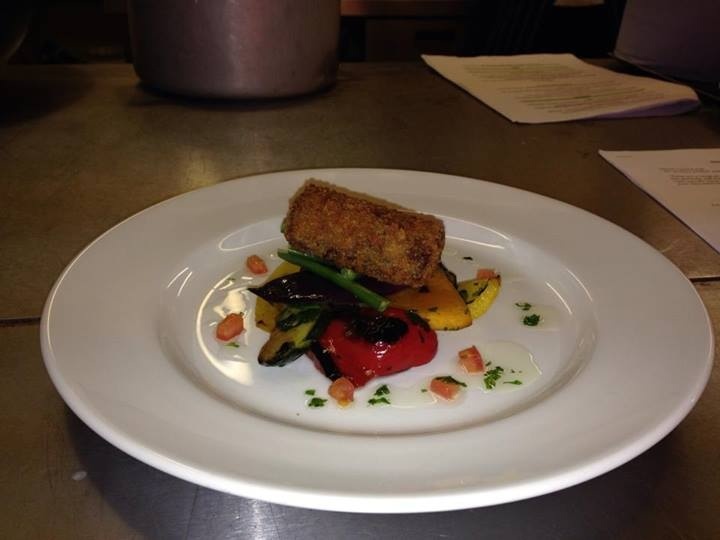 A starter of Confit Lamb Shoulder Croquette, Warm Vegetable Salad, Mint Dressing. Lovely! Exciting times for us and our clients next year! We are very much looking forward to 2014! Friday saw the team back at Parmiters school for the 3rd year running serving them a delicious 4 course meal for their Annual Govenors Dinner for 170. They started with Leek and Potato Soup finished with Crispy Leeks and Gruyere Toasty; Main Course was Roasted Breast of Corn Fed Chicken, Champ Potato, Warm Salad of Roasted Butternut, Peas, Chorizo and Green Beans, Madeira Jus; followed by Sticky Toffee Pudding, Salted Caramel Sauce, Clotted Cream for dessert. Cheeseboards and Biscuits with Port & Brandy, Tea & Coffee served with Petit Fours completed the delicious meal. Cooked to perfection by Dan, John and MJ in the school kitchen and all served pipping hot by our professional front of house team! The walk from kitchen to tables was quite far and included 3 rather slippery steps! well done everyone! We received this from Jackie who organised the event this morning, so good to get lovely feedback like this! I have had so many people saying how much they enjoyed the evening and all of them added and the food was the best ever, so tasty and served hot. So an enormous thank you to you and your team and to Laura for her work front of house. Everyone of your team was courteous and helpful. These events are always something I look forward to but also have a responsibility for so enjoying myself comes a bit lower down my list, however I had a great time too. Once again a big thank you and, we will be in touch again when we have our next dinner. In the meantime please have a busy and prosperous Christmas but also time over the festive season to enjoy family and friends. 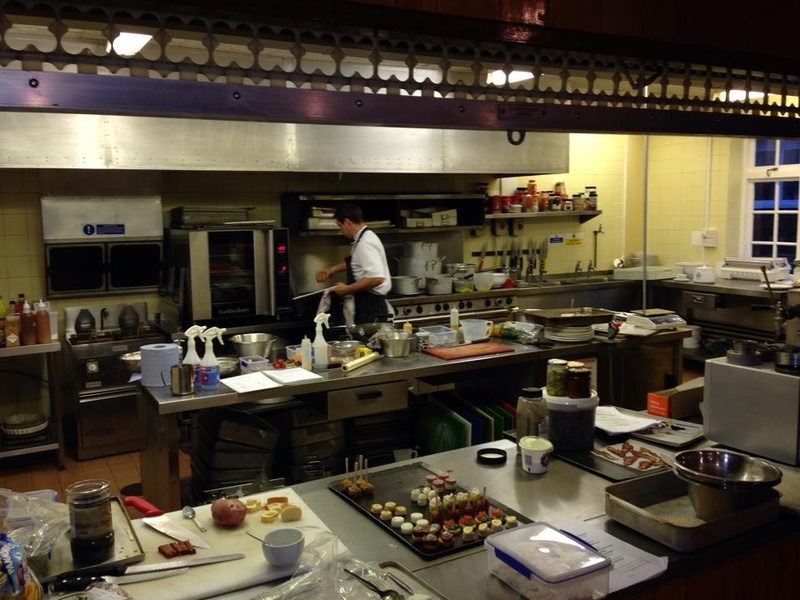 Kitchens have been busy over the last week or so, with new menus being finalised! Dan & John are putting together the final touches to some delicious new dishes which will be added to our menus on the website in the next few weeks. Some new choices include; Thai chicken and Mexican chicken with tequila burgers; on the BBQ menu, chicken liver parfait, brioche with spiced plum chutney; Proscuitto, basil, ricotta & cracked black pepper crepe; and beetroot gravaadlax, peppered mackerel, horseradish & watercress on the canapés menu. Also fruit dusted meringue straws and Bakewell tart on the sweet canapés menu! Yum! Yum! Can’t wait to try them all! Photographer coming in next week to take pictures, the website will look great with all these new shots! If that wasn’t keeping us busy enough, we are meeting with all our lovely couples for tastings, tonight we are seeing the lovely Lucy & Kevin who have booked Tipis at Lavendar Farm next August. We will finalise their menu, timings for the day and help them prepare for their big day! 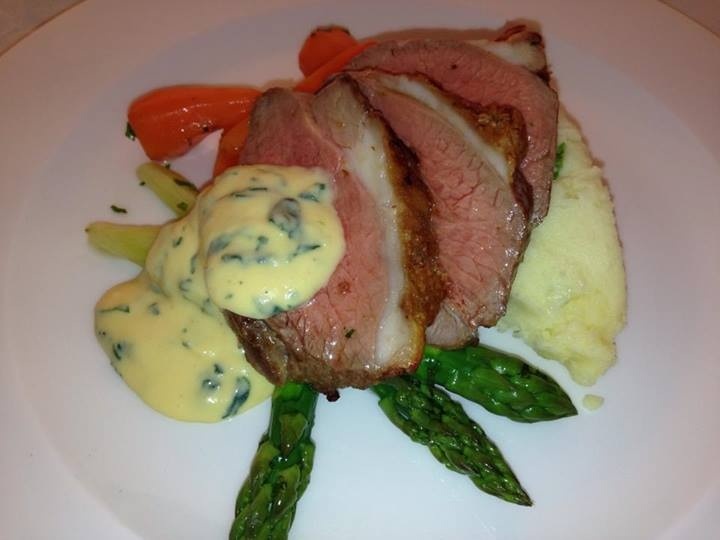 Friday sees us back for the 3rd year running at Parmiters School serving a 3 course meal for their annual Governors Dinner. School kitchens to cook in, but definitely not a school dinner! 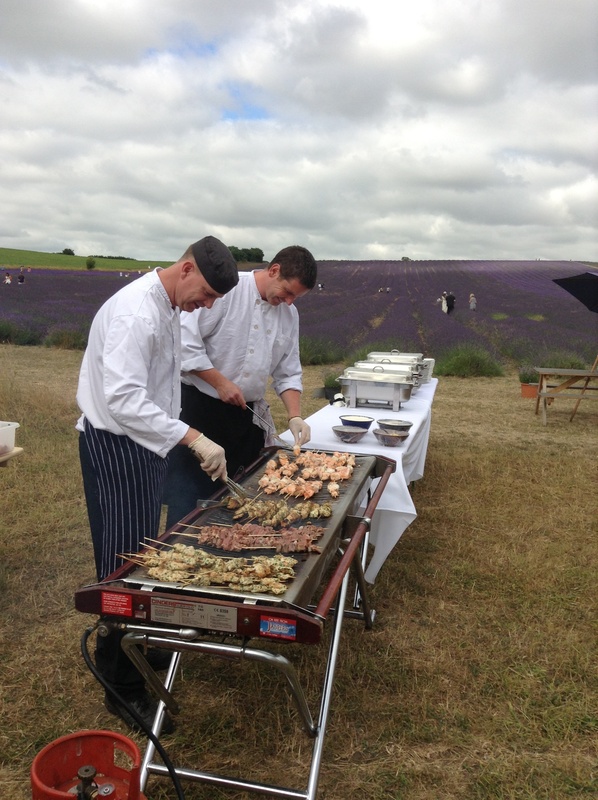 BBQ last summer at the beautiful Lavendar Farm, more of these to come next year! This Thursday, we are off to serve champagne and canapés at a charity evening to other local businesses to raise money for The Hospice of St.Francis. On the evening, guests will be welcomed by the talented hair team, who will be on hand to offer colour and extension consultations, expert at home styling and maintenance tips, and taster shiatsu head massages. There will also be product and blow-dry demonstrations, and a beautician available for skin and bodycare advice. Guests will be able to purchase discounted salon vouchers, take part in a raffle prize draw and take home a complimentary goody bag. Raffle prizes include ghd Irons, £100 Clipso vouchers and photography vouchers. All money raised will go to The Hospice of St Francis. The Hospice of St Francis cares for patients with a wide range of life threatening illnesses – cancer, heart disease, lung disease and neurological illness. Care is given in their Inpatient Unit and the Spring Centre which includes outpatient clinics and carer groups. Their care is also available beyond the Hospice building, in the home, in local hospitals and nursing homes. Kingfisher are delighted to have been asked to be part of this event. Contact Ian at Clipso if you would like to come along. 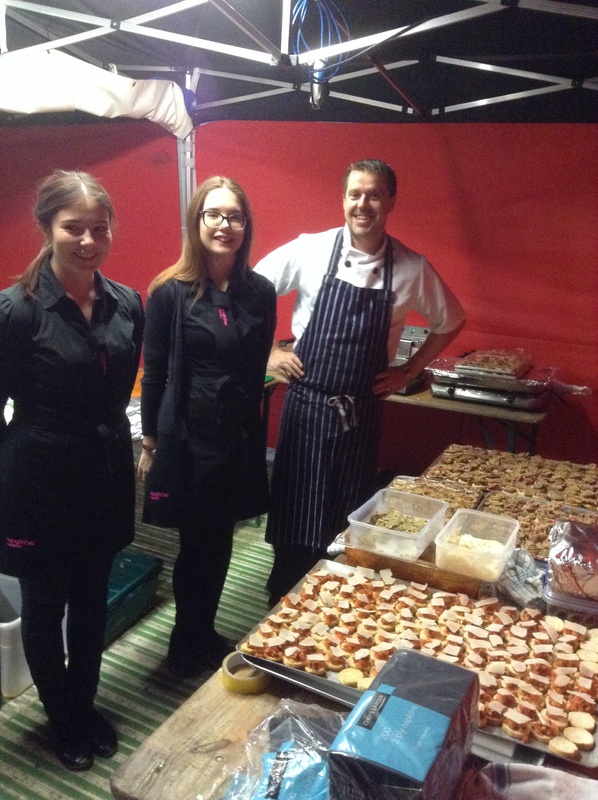 Masked Ball & 1000 canapés! Last night saw the KF team at the horse stuntman, Steve Dent’s beautiful home in Rickmansworth to celebrate his daughter Sam’s 21st birthday. It was a masked ball attended by 200 family and friends. 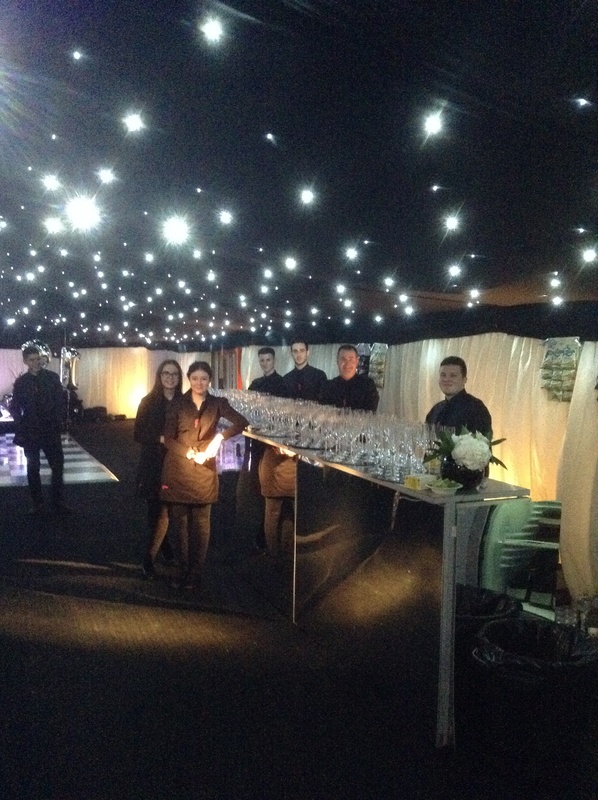 John prepared over 1000 canapés and we served drinks from 2 bars all evening. Sam looked stunning and the guests looked great in their masks, the music rocked till the early hours with everyone dancing and having fun. They were still going strong when we left at 2am! 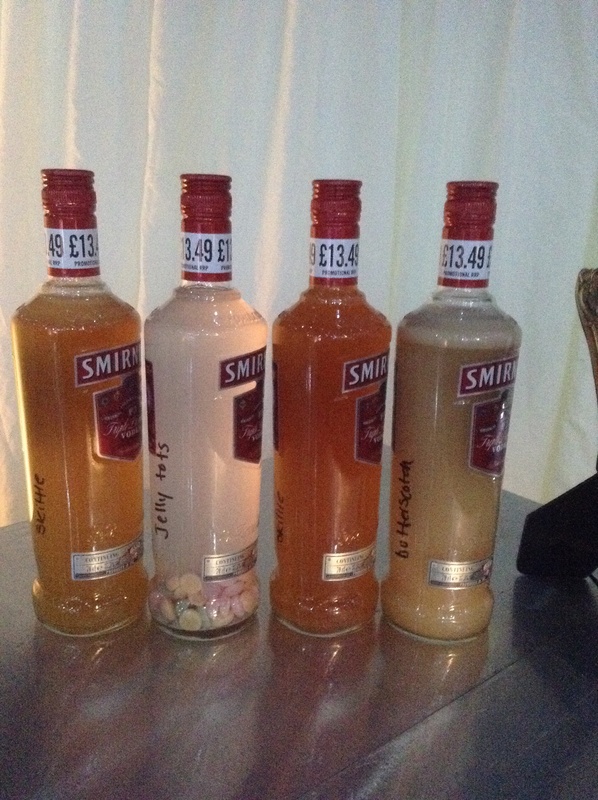 The shot bar was very popular, with jäger bombs, tequila shots and some very interesting sweet filled vodka!